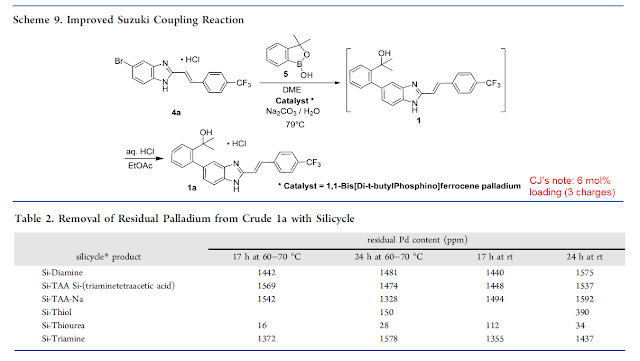 one issue with Pd-catalyzed reactions like Suzuki is that you get residual Pd(II) complexes, and you often get also Pd(0) in the form of "soluble" Pd black - very fine colloids of nanoparticles that get through filters. Thiourea is probably good for getting rid of Pd(II) but for Pd(0) colloids you need a thiol + air oxidation. I'm Valerie, the Product Manager for our Metal and Organic Scavengers at SiliCycle. Over the years and our past experience with scavengers, it has been clear that combining multiple scavengers was a strong strategy for maximum chelating of undesired products. Combining multiple scavengers was even working stronger than using more equiv. of a single one. This is, not surprisingly, even more valid when multiple species are present in solution and to be get rid of. In fact, we've noticed this synergy no latter than last week in one of our R&D services for a pharmaceutical client. When there is a clear noticing that the scavenging level has plateaued, a strong move is really to mix the best two scavengers, which will often prove to be more effective than the usual other optimization approaches (temperature, time, etc.). Milkshake is on point as usual, it's likely a bifunctional mechanism. I would nitpick that high salt conditions aggregate and precipitate nanoparticles (DLVO interaction) but that's not the same as Ostwald ripening, unless the anion is also corrosive like chloride is with Pd. Adding a trace of bromide into the salt mix will greatly accelerate the process, especially with the more difficult Au and Pt dispersions.